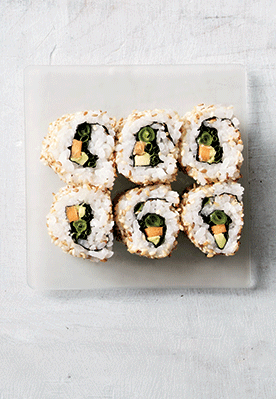 ** Variations: Vary the vegetables – try courgette or cooked squash – or even use soba noodles as a filling. The world is your oyster! Try linseeds instead of sesame seeds. 1. Place the nori sheet on a work surface with the lines running vertically. Fold the sheet in half lengthways, then tear or cut along the fold so you have two rectangles. 2. Lay one rectangle on a clean board. Arrange the other ingredients around it and place a bowl of warm water alongside. Wet your fingers in the water, then press half the rice over the nori. Sprinkle with half the sesame seeds. 3. Lay a sheet of cling film on a sushi mat. Lift the rice-covered nori sheet and place it rice-side down on the cling film. (Don’t worry – the rice is sticky, so it won’t fall off.) Add your chosen filling, placing it near to the edge of the nori closest to you. 4. Lay two pairs of green beans along the edge of the rice nearest you and cover with half of the avocado, chives and carrot. 5. Spread half the spicy sauce over the filling, if using. 6. Lift the edge of the mat and roll it away from you using your thumbs whilst holding the filling in place with your fingers. Continue lifting the mat and the cling film until the filled nori forms a roll underneath them. Dab a little water on the uncovered top edge of the nori to seal it. Chop the ends off to neaten and cut the finished roll into six equal pieces. Repeat this process with the remaining half sheet of nori and the remaining ingredients. 7. Serve with soy sauce and wasabi paste for dipping, if liked. 1. Wash the rice in cold tap water until the water runs clear. This should take a couple of rinses. Drain and set aside for at least 15 minutes. 2. Put the rice into a saucepan and add the filtered water. Cover and bring to the boil (about one to two minutes), then reduce the heat and simmer for 12 minutes. Turn off the heat and leave, still covered, for 10 minutes. 3. Wet a flat tray and spread the rice over it. Sprinkle with the sushi rice seasoning vinegar and stir gently but thoroughly with a wooden spoon, lifting and folding the rice to help it cool slightly and absorb the seasoning. If you want to be really Japanese about it, you can fan it to help it cool. 1. Put all the ingredients into a blender and whizz to make a smooth sauce. 2. Use the sauce immediately, or store in a screw-top jar in the fridge until needed. Recipe taken from Itsu: The Cookbook – 100 low calorie eat beautiful recipes for health and happiness (£15.99, Mitchell Beazley).